I have been blogging for just over a year now, last week I was thinking about how different my blogging routine is compared to when I first started so I thought I would share with you my blogging routine. Blog Schedule - I have changed my blogging schedule so many times since starting my blog, as I am trying to figure out what works best for me and my blog. Currently I am posting on Monday, Wednesday, Friday and Sunday. Organising Posts - I prefer to organise my posts instead of waiting until the day, I think personally for me it increases the quality of the post as it gives me longer to perfect the vision I have. What I like to do to organise posts is to write a list of the ideas I have and then select from that list. Scheduling/Planning - I bought an Erin Condren Life Planner at the beginning of the year to organise not only my life but my blog. I use my planner to schedule what post is going up on what day. I especially like to do this on the monthly overview so I can pencil in the posts to pre write them. Photography - I take all of my blog photos on my iPhone 6, and edit them using only 2 apps on my phone, you can see how I edit my photos here. I like to take my pictures for the posts before writing it because I like to see my post come together whilst I am writing it. Writing/Content - After taking the photos I start to write the post, I will first write a rough draft, a big mug of coffee is always essential during this section! I will then re-read the post so I can make any necessary adjustments. Promotion - After I have published my post I then promote it, I share my new posts on Instagram, Twitter, Facebook and Pinterest. I also like to take part in relevant twitter chats as they're a great way to chat to other people in the blogging community and to also make other people aware of your blog. Throughout the week I like to use Bloglovin to read and comment on other peoples posts. 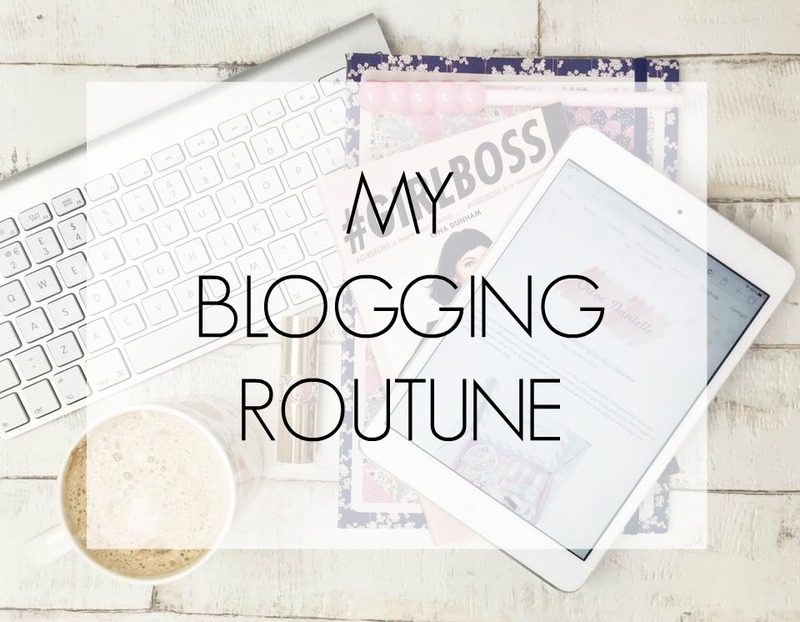 Do you have a specific blogging routine? Lovely post, we actually have a similar blogging routine. I also like to take pictures before I even start writing my post and I use my iPhone because I think it actually does a very good job. I am very impressed with the amount of times you blog in a week - I definitely can't do that! Thank you! I find taking the pictured before writing allows you to see the post come together much more smoothly. iPhone cameras are really good these days although I do really want a fancy slr haha. love reading others routine but i do not have one haha. great tips, it really helps to be organised! I can't really have a routine because I work full time and some times do overtime so work cuts in to my personal life sometimes, I also can get so tired some days that all I prioritise is sleep, I wish I did have more of a routine when it came to blogging but it mainly just runs on when I have time. I wish I had a better routine for blogging, hopefully I'll be able to incorporate some of this organisation into my own blogging routine. Thanks for sharing!